Hello!! This page will archive the WHAT'S NEW entries from the front page. It is meant to keep everyone up to date on the progress of the website. Work done on the site isn't always obvious, Hopefully this page will let you see the the new stuff, without having to surf the entire site. As always your suggestions, questions, and comments are welcome!! E-mail us, it don't cost nuthin'!! 01/30/08 Added two more denarii from the collection of Kevin Ingleston; this Vespasian with prow and star reverse, and this Severus Alexander beauty with Jupiter hurling thunderbolt. 01/28/08 Added a nice Hadrian denarius with Galley reverse from the collection of Kevin Ingleston. 12/18/07 Added a Lucilla denarius, which is a brand new addition to my own collection. 12/15/07 Ater a long hiatus and some technical problems finally added a page for Diadumenian, featuring this gorgeous denarius from the collection of Bob Rinaldi. Don't miss that jewel of a coin! 07/01/07 Added this Augustus denarius and this Tiberius 'Tribute penny' from the collection of Bob Rinaldi to the Roman Imperial collection, as well as this vitually 'as minted' zapped Probus Antoninianus from Glenn Simonelli to page 3 of "The One Coin" gallery. 06/06/07 Added this gorgeous Macedonian Tetradrachm that Shay Harris received as a birthday gift from Mark last year to page 3 of "The One Coin" gallery. 05/26/07 Added this Aelius denarius and Lucius Verus denarius, both new additions to my own collection. 05/17/07 Created the page for Severus Alexander, featuring 9 denarii and 1 sestertius from the collections of Mark Lehman, Bob Rinaldi and Jan de Veen. 05/05/07 Added another nice Orbiana denarius from the collection of Bob Rinaldi. 04/05/07 Added four more denarii from the collection of Bob Rinaldi: They are from Galba, Nerva, Lucilla and Aquilia Severa respectively. 02/21/07 Added this Clodius Albinus denarius from the collection of Bob Rinaldi. 02/17/07 Added this great Julia Paula denarius from the collection of Bob Rinaldi. 01/31/07 Added two more denarii from the collection of Bob Rinaldi: One from Crispina and this one from Sabina. 01/29/07 Added a great Aelius denarius from the collection of Bob Rinaldi. 01/28/07 Added 2 Vespasian denarii, 1 Vespasian dupondius, 1 Titus denarius and 1 Titus sestertius from the collections of Kevin Ingleston and Jan de Veen. 01/27/07 Added a rare Nero and Claudius Didrachm from the collection of Bob Rinaldi. 08/23/06 Added the page for Macrinus, featuring 2 denarii from Chris Storck and Pierre R. Monney, and 1 dupondius from the collection of Mark Lehman. Also added the Plautilla page, containg 1 single denarius from David B. Wilber's collection. Surely there are more Plautilla coins out there among our AP members' collections? 08/22/06 Changed the short biography and added a bust, 3 antoniniani, 8 denarii and 1 sestertius from the collections of Derrick Jewell, Mark Lehman and yours truly to the Elagabalus page. 08/17/06 Added 7 denarii, 2 sestertii and 1 as from the colections of Mark Lehman, Jan de Veen and Chris Storck to the Septimius Severus page. Also added 1 denarius from David B. Wilber to the Caracalla entry, a bust, 2 denarii and 1 sestertius from Chris Storck, Mark Lehman and Jan de Veen to the Julia Domna page, and last (but not least) 3 denarii and 2 sestertii from the collections of Chris Storck, David B. Wilber, Mark Lehman and Jan de Veen and a bust to the Julia Mamaea page. Next up: more coins from our collective collections to several of the "other" Severans! 08/12/06 Added 2 antoniniani, 7 denarii and 2 sestertii to the Caracalla entry, bringing the total up from 1 to 12 coins listed for this infamous emperor. Also added a Caracalla bust to the page, and one for his fater Septimius Severus. 08/04/06 Added three coins to the Domitian section. This RIC 246 (Vespasian) denarius from Kevin Ingleston's collection, as well as this RIC 145 denarius and RIC 301a As from my own collection. 07/30/06 After taking over from Kevin (great work by him over the past period!!!) I started getting a feel of the site by adding a Mark Antony Legionary denarius from my own collection and performing some minor updates to the Roman Imperatorial section, including busts and short biographies of Julius Caesar and Mark Antony. 11/21/05 Added some more coins of Septimius Severus, as well as a coin of Pescennius Niger. Thanks to Jonathan Gawne and Pierre Monney for their submissions. 11/18/05 Added a Domitian Sestertius and a Titus Denarius submitted by Joe Winnett. Also posted several coins of Septimius Severus submitted by Jonathan Gawne. Thanks guys!! 11/17/08 I added a very nice coin of Septimius Severus submitted by Pierre Monney. Thanks Pierre!! Thanks for the submission. Still waiting on the rest of you! I also need a volunteer to write some blurbs for the different Republic and Imperatorial pages. Any one interested? 11/08/05 I added a coin of Septimius Severus, submiited by Ben Brauchler. Thanks Ben!! Where are the rest of the Septimius Severus coins that the group has? I'm sure there are bunches, lets get 'em submitted!! 10/30/05 Some short break!! I have finished the coins thet werer submitted for the Civil War of 193-197 A.D. We have coins from Pertinax, Didius Julianus and Clodius Albinus.I also added a nice Trajan Coin. Thanks to Mark Lehman, and Bob Brinsfield for their submissions. Now lets start seeing those coins for Septimius Severus!! 05/10/05 Finished the Roman Republic and Imperatorial pages. All coins submitted for the group collection are posted!!! YEE HAA!! I will take a short break, then we will start on the Civil war and Severan Dynasty pages. I do need a volunteer to write some blurbs for the different Republic and Imperatorial pages. Any one interested? 05/03/05 Tony Jaworski and Tom Ross, owners of www.commonbronze.com are graciously hosting our site. Thanks guys!!! To celebrate I have finished the Adoptive collection. All coins submitted for the Adoptive collection are posted!! Next I will be starting the Republic and Imperatorial collection that I have been putting off because of my lack of knowledge in the area. 03/28/05 Updated the Faustina Sr. page. I also finished the Faustina Jr. page. Hopefully We will wrap up the Adoptives in the next week or two. 03/01/05 Updated the Augustus and Titus pages. Also finished the individual coin pages for the Marcus Aurelius page. Cleaned up some errors on other pages, I'm sure there are more to be found. Come on guys, you are supposed to watch me closer than that!! 02/24/05 Updated the Augustus, Trajan, and Antoninus Pius pages. Thanks to Tom Mullally for the new coins!! Also worked on the Marcus Aurelius page. 02/21/05 Finished the Faustina Sr. page. All the coins submitted thus far for Faustina Sr. are now posted on the site. I have started processing the images and submission forms for Marcus Aurelius. Hope to have his page done my the weekend. 02/19/05 Finished the Antoninus Pius page. All the coins submitted for him have been posted!! I'm processing the images for the other coins submitted (resizing, making thumbnails, and renaming), and attributing the coins with no or incomplete attributions. The Faustina Sr. page will be coming shortly!! Thanks to all that have submitted coins! 02/08/05 Updated the Agrippa page. Thanks Jan de Veen for your submission. The second part of the adoptive collection is comming along. I have around 70 coins that all need to be resized, many need to be attributed, then I need to catalouge them and then i'm ready to post them. The Antoninius Pius page is nearly ready to be posted. 02/01/05 Updated the Augustus, Galba, Germanicus, Caligula, Vespasian, Titus, Trajan, and Nerva pages. Thanks to Jan de Veen and Chris Storck for their submissions!! Did some tinkering with page anchors on the Nerva and Aelius page. 01/29/05 Updated the Augustus, Vespasian, Domitian, Nerva, Trajan, and Hadrian pages. Thanks to Tom Mullally, Chris Storck, Harry Stewart, Brett Telford, Joe Mastrario, and Mark Lehman for their coin submissions!! I promise, the Aelius page is coming soon!! 01/28/05 Updated the Nerva page. Filled in the coin attributions, and created the individual coin pages. Received more coins for the collection from Tom Mullally, thanks Tom!! Hopefully I will have time this weekend to complete the Aelius page, and update the other pages I have recieved coins for. 01/13/05 Changed the front page a bit. It just didn't look good, too choppy.I like this better, I hope you do too. Please feel free to e-mail me with any suggestions and comments. NEW SEARCH FEATURE installed. Look for the search link above, or click here to check it out. I hope you like it. I promise to get to work on the collection very soon. I was getting a little burned out, and my personal collection and website were a bit neglected. Sorry for the delay. 01/04/05 Finished the Hadrian and Trajan pages, all Hadrian and Trajan coins submitted so far are posted. Added anchors to Roman Imperial Coinage home page. Now when you click a link to it from any of the collection pages, you will be taken to where you left off (i.e if you click the Roman Imperial Home link from the Domitian page, you will be taken to the Flavians section of the Roman Imperial Coin home page). Thanks to Andy Thall and Chris Storck for their recent coin submissions! 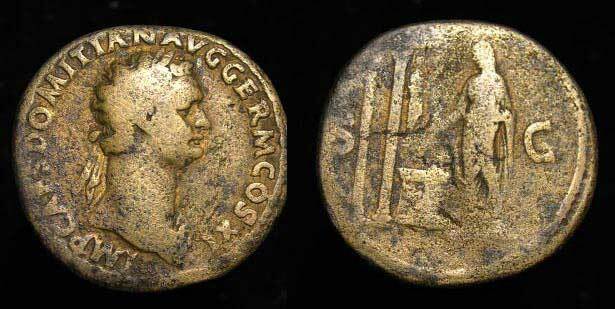 12/30/04 Added a sestertius to the Vespasian page, thanks Chris Storck!! Also more coin photos added to the Adoptive collection for Nerva, Trajan, and Hadrian. Thanks Brett Telford, Mark Lehman, Harry Stewart, and Me, for the contributions!! 12/29/04 Added two Asses to the Domitian page. Thanks Brett!!. Also started Adoptive Collection 15 coins submitted, thus far...Keep 'em coming! !